Peugeot is emphasizing the flexibility of the Rifter, a version of its small cargo van that is designed to haul people. 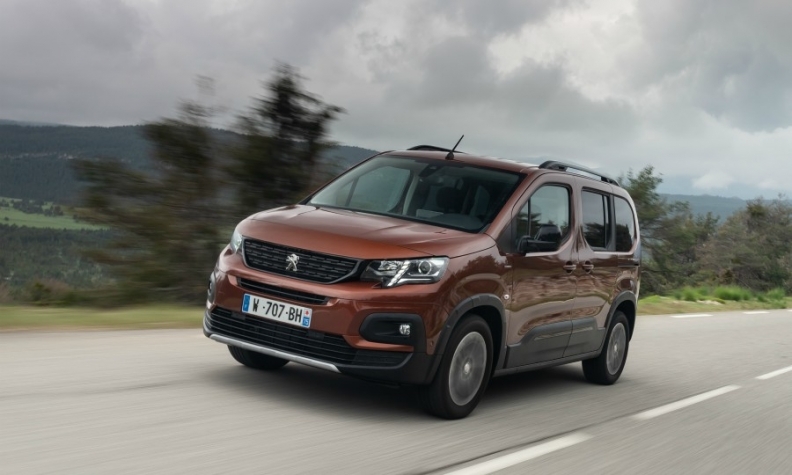 Peugeot has designed the new Rifter, the passenger variant of the automaker's small cargo van, to appeal to buyers of both SUVs and minivans. The previous generation was called the Partner Tepee. The name was changed to differentiate it from commercial versions, which will still be called the Partner, Peugeot said. "We have totally integrated the Rifter into the Peugeot lineup," said Nicolas Judenne, the product manager for the new model. As with the rest of the range, the Rifter is available in the higher-end GT Line trim as well as lower-end Active and Allure editions. The Rifter competes in the car-derived van segment in Europe, where the top five sellers are the Volkswagen Caddy, Dacia Dokker, the previous-generation Citroen Berlingo, the Partner and Renault's Kangoo, according to UK-based market researcher JATO Dynamics. The Rifter architecture combines PSA Group's EMP2 platform for compact and midsize vehicles in the front and the previous generation's underpinning at the rear. Styling cues also found on recent Peugeot models include a more upright grille, side surfacing and "lion's claw" taillights. Keith Ryder, the design director for the Rifter and Partner, said a more dynamic look was created with a shorter hood, high cowl, and reduced front and rear overhangs. Inside, the Rifter gets Peugeot's i-Cockpit, which features a smaller "double D"-shaped steering wheel to provide unobstructed views of the instrument panel. One new feature is power rear windows, which Ryder said the marketing department requested. The passenger airbag has been moved to the roof, allowing a glove box large enough to hold a laptop. Judenne said Peugeot has added driver assistance features such as adaptive cruise control and lane-departure warning that are more common in passenger cars. "We wanted to have the same level of driver aids as the 3008 SUV," he said. Engines: A 1.2-liter gasoline engine will be offered in Europe, with 110 hp or 130 hp (in 2019). A 1.5-liter diesel is available with 75 hp, 100 hp or 130 hp. Flexibility: A rear window that opens independently of the tailgate is available to ease loading in tight spaces. The passenger and second-row seats fold flat to accommodate large and long objects. The Rifter contains more than 20 interior storage compartments, including under the rear floorboards and above the parcel shelf below the roof. Safety: Latest-generation technology includes adaptive cruise control, lane-departure warning and control, active safety braking, blind-spot warning and a bird’s-eye view backup camera. Light: A suspended, illuminated bar spans the length of the interior below a panoramic sunroof. Small items can be stowed inside it. Recharging options: The Rifter has seven interior chargers, including a wireless dock for smartphones.